His tail never stops wagging. 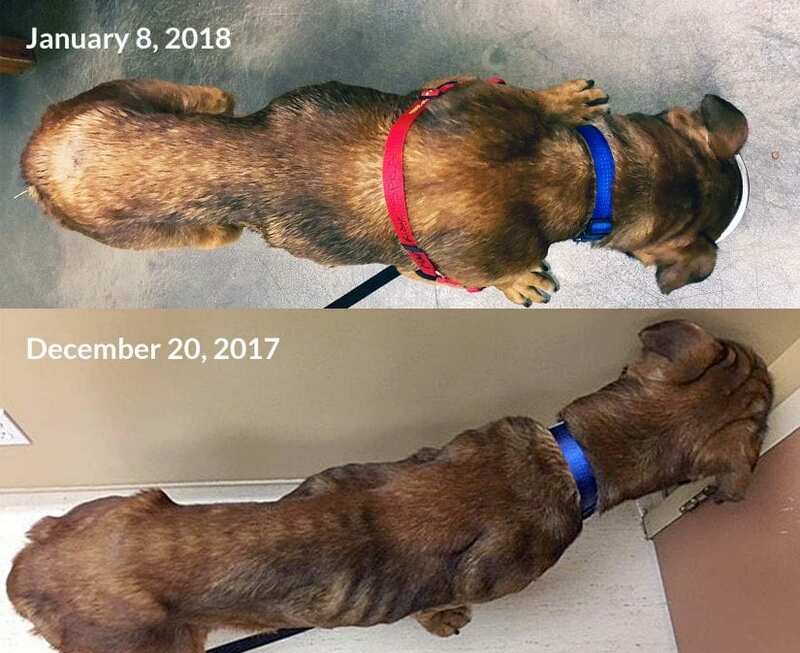 Handsome, the emaciated mastiff rescued from a property in Hope in December, found tethered with a chain outside in freezing cold temperatures, was happy to go to his forever home Friday. Adopters Pat and son Nolan say the friendly gentle giant, who has gained weight since being rescued and looks much healthier, will have a large, fenced backyard to run around in, where he’ll be free to just be a dog. Maple Ridge BC SPCA Branch staff and volunteers even threw Handsome a party for his happy adoption day! Handsome, an emaciated mastiff rescued from a property in Hope in a joint effort by RCMP and the BC SPCA Dec. 20, is on the road to recovery at the Maple Ridge BC SPCA Branch. 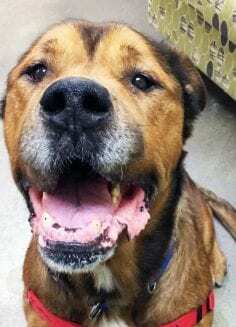 When he came into BC SPCA care, Handsome had a body condition score of only one out of nine and weighed 35 kilograms. 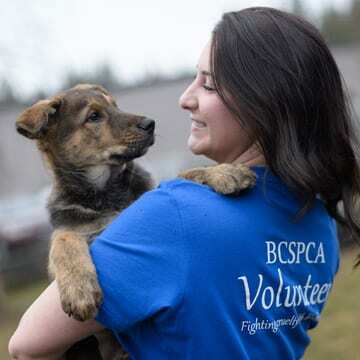 Now, he weighs 46.4 kilograms and is winning the hearts of BC SPCA staff and volunteers. 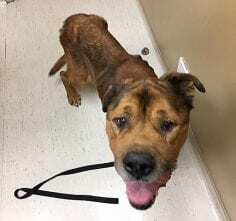 The BC SPCA’s cruelty investigations department is close to recommending charges of animal cruelty against Handsome’s former owner. Handsome must still have several teeth removed because they were worn down to the gums, something veterinarian Dr. Adrian Walton says is common when dogs are chained or crated for long periods of time and they chew or pull on the chain or bars. When he is fully recovered, the gentle giant will be available for adoption. 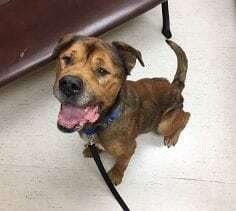 A seven-year-old mastiff dog named Handsome is lucky to be alive after being rescued by the BC SPCA. In a joint effort, RCMP and BC SPCA constables attended a property in Hope Dec. 20, where they discovered the starving dog, who was extremely emaciated, outside, tethered on a heavy chain, surrounded by ice and snow. A bucket of water, frozen over with ice, was nearby, as well as a thin wooden doghouse without insulation or bedding that was surrounded with ice. Drever says it is impossible to comprehend how anyone could allow a dog to be chained up, in such frigid winter weather conditions. “We rescue thousands of animals from heartbreaking situations every year at the SPCA, but cases like this are particularly shocking,” she says. Such cases can serve as a reminder for pet guardians to ensure they keep their pets safe throughout the winter, Drever notes, by bringing them indoors or, if outside, ensuring they have access to adequate shelter and bedding that is warm and dry, food and water that is not frozen over with ice. The BC SPCA is investigating and will be recommending charges of animal cruelty against Handsome’s former owner. The costs associated with Handsome’s care are expected to exceed $4,000 for medical treatment, care and rehabilitation. 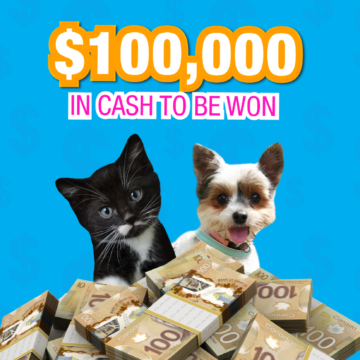 A non-profit organization, the society relies primarily on public donations to help the province’s most vulnerable animals. 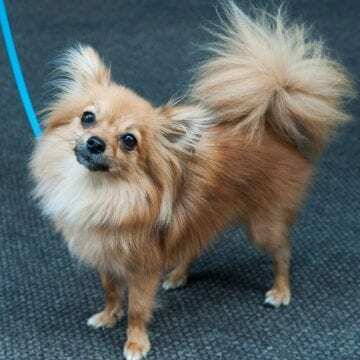 If you can help Handsome and other animals like him in BC SPCA care, visit spca.bc.ca/medicalemergency. To find out more about cold weather pet safety see our resources.